Who should take over from Henry Cavill as Superman? Much like Bond, it’s time for a black Superman and rumour has it that Warner Bros. is indeed considering Michael B. Jordan as Cavill’s replacement. It makes sense, Jordan proved he has superhero star power in Black Panther, but his turn in Fantastic Four didn’t really give him a chance to show us what he can do as a hero. More Superman movies might be a while off yet, but when Warner is ready to reboot the Man of Steel, doing so with Michael B. Jordan could be a stroke of genius. Rumours might be circulating that Game of Thrones’ Kit Harington is being considered to take over from Ben Affleck as Batman, but don’t you think he’d make a better Superman? Imagine him clean-shaven and with short, slicked-back hair (it’s hard... I know) and I think you’ll find he has a distinctly Superman-ish look to him. Ok, so he’s British which would be a pretty tough sell for the all-American hero, but who knows? Maybe Harington can do a brilliant Kansas farm boy accent! Speaking of all-American heroes, it doesn’t get much more star-spangled banner than Armie Hammer. Just look at his boyish good looks and tell me this isn’t the face of someone who was born to play Superman? We know he’s got the acting chops for it thanks to his turns in Call Me by Your Name and The Social Network, but he’s sadly never broken into the superhero genre despite being a perfect fit. Plus, he could get tips from his The Man from U.N.C.L.E. co-star Cavill on how to play Supes. Another dark-haired, Superman-looking suggestion comes in the form of Oscar Isaac. Yes, he has the disadvantage of already being a part of another huge movie franchise, which could cause many a schedule conflict, but if Warner could make it work, Isacc could be the perfect person to take over from Cavill as Superman. He’s got the looks, the charm, and the acting experience… what more do you want? You might not recognise his name, but Tyler Hoechlin has some pretty impressive credentials when it comes to taking over from Cavill. He played Superman in the second season of the Supergirl TV show and his turn as Kal-El was heralded as one of the best yet by fans. While the DCEU and the Arrowverse haven’t crossed over so far, this could be the perfect opportunity to bring the two universes together and form a similar relationship to the one the MCU and the Netflix-Marvel world has. Here’s another clean cut American actor who’d be perfect to play Clark Kent. John Krasinski is the perfect mixture of the ‘hot new thing in Hollywood’ and the seasoned professional. He’s plenty of experience in the industry (just check out his IMDb), but is finding new fame as a leading man thanks to the huge success of A Quiet Place. If Warner Bros. is looking for someone who knows what they’re doing, but isn’t too famous, Krasinski could be the one. No doubt when you saw this name come up you thought ‘YES!’ That’s because Channing Tatum has everything it takes to be the new Superman. Not only does he have the clean cut good looks and buff body that playing the Man of Steel requires, but he’s also got that all-American charm too. I can just see him putting a cheeky spin on Clark Kent that could reinvigorate the character and be just what the DCEU needs. Plus, he already voices Superman in The Lego Movie franchise! Ok, hear me out! I know this seems like a crazy suggestion given that Chris Evans is one of the pillars of the MCU, but he can’t play Captain America forever (in fact, his time could very well be up after Avengers 4) and we know he can pull off the boy scout superhero persona to perfection. 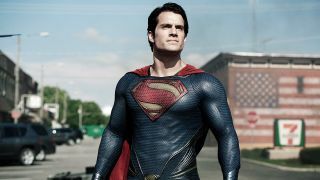 While it might seem unlikely that he’d dive into another high profile extended universe role straight away, we won’t be getting another Superman movie for a while. Maybe by the time Warner is ready to return to the franchise, Evans will be ready to return to the spandex? Enough said really. We were going to get a Superman movie with Nic Cage way back when Superman Lives was still in the works and although it never happened, it’s the most famous of the unmade Superman films thanks to some pretty compelling photos of Cage wearing the red and blue suit. With Cavill stepping away from the role, now could be the time to give Cage another chance. You might say Cage is too old to play the Man of Steel… I say, CGI can work wonders!